Italian and Spanish bond yields are falling with German ones. Investors no longer view southern European debt purely through the prism of credit risk. That makes sense for now. But over-optimism may be unwise, especially if low-to-no inflation hampers debt-cutting. 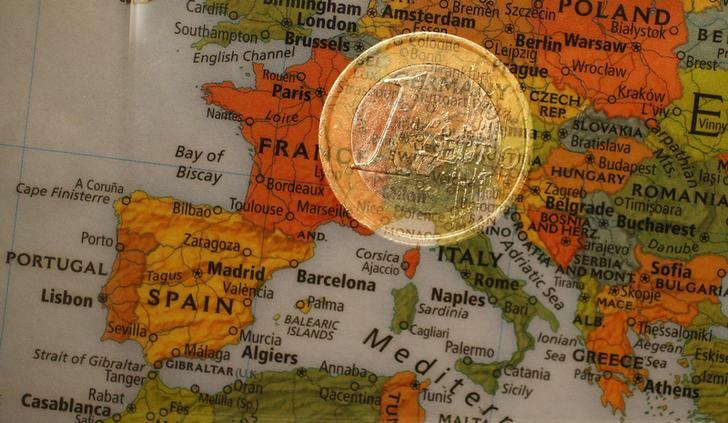 Euro zone inflation was 0.8 percent in February, according to the EU statistics office, Eurostat. Inflation was flat in Spain and 0.5 percent in Italy, according to national statistics releases for the same month. Ten-year German bond yields have fallen to 1.564 percent from 1.694 percent on Feb. 25. Comparable Italian yields have dropped to 3.466 percent from 3.824 percent over the same period while Spanish ones have slid to 3.486 percent from 3.587 percent. An IMF working paper estimates a 1 percentage-point increase in the share of government debt held by foreign investors could explain a 6-10 basis point reduction in long-term sovereign yields, based on 2004-2012 data for 22 advanced economies.